Baugh's Blog: Book Review: Charles Dickens 13 - "A Tale of Two Cities"
Book Review: Charles Dickens 13 - "A Tale of Two Cities"
﻿The origin of A Tale of Two Cities – Charles Dickens’s famous novel set during the French Revolution – goes back ultimately to Thomas Carlyle’s influential book The French Revolution: A History, which was published in 1837, when Dickens was 25 years old. Dickens became obsessed with the book, and he read it hundreds and hundreds of times. He eventually met Carlyle and they became friends – the Scottish author came to see some of Dickens’s amateur theatricals, and he sometimes offered praise and critiques of the younger writer’s novels. When Dickens was writing A Tale of Two Cities through most of 1859, he carried Carlyle’s book around with him all the time – there is a photograph of Dickens that shows him reading it in the garden at Gad’s Hill Place. Of more immediate influence on A Tale of Two Cities were two plays: The Frozen Deep by Wilkie Collins, and The Dead Heart by Watts Phillips. 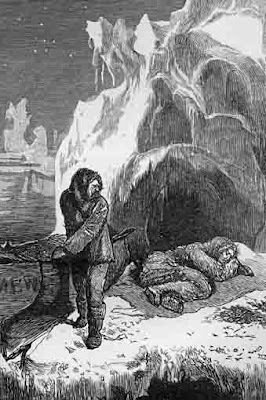 Dickens had long been fascinated by accounts of the doomed Arctic voyage of the John Franklin expedition. In 1845 Franklin had attempted to find a way through the last un-navigated section of the Northwest Passage. Dickens had written several articles about the expedition for his magazine Household Words. When Wilkie Collins and Dickens were visiting Paris together in early 1856, Dickens persuaded his friend (primarily a novelist) to write a play based on the Franklin expedition that could be presented at the next Dickens family Twelfth Night celebration at Tavistock House. Although Collins wrote the drama, Dickens was constantly giving him advice; and later he heavily revised it and added some scenes of his own. And, as usual, Dickens took charge of virtually every aspect of the production. ﻿The Frozen Deep turned out to be a melodrama concerning the rivalry between two members of the expedition for the same woman. Wilkie Collins played the part of the expedition leader, the successful suitor; and Dickens acted the part of Richard Wardour, who had been rejected. Wardour is presented as an ambivalent character who is motivated both by love and anger. But at the conclusion of the play, Wardour sacrifices himself, in order to save the life of his rival. Dickens revised and edited his part – creating a good man whose heart and soul had been frozen by his loss of love. As Peter Ackroyd points out in his biography, the character of Wardour became a “self-revelation” for Dickens. He had always shown great ability as an actor in previous amateur theatricals, but this time his identification with the part was intense. There had often been a rather histrionic tendency in his approach to drama, but eyewitness accounts described an even more extraordinary frenzy in his acting. A review in The Leader noted the “savage energy” in his performance. 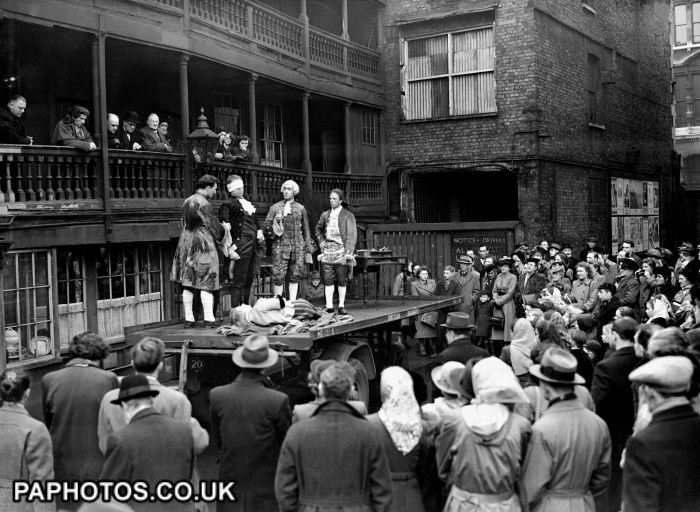 In addition to the Twelfth Night production on 6 January, Dickens’s amateur troupe gave three more performances that week - about 90 people were present for each. After the intensity of this week of performances, Dickens and Wilkie Collins took a break from work for a few days down in Brighton. During their stay on the south coast, Dickens’s friend Benjamin Webster – the actor and dramatist who ran the Adelphi Theatre in London – read to him the manuscript of a new play by Watts Phillips called The Dead Heart. It was also a story of self-sacrifice – set this time in Paris during the French Revolution, rather than the frozen Arctic. 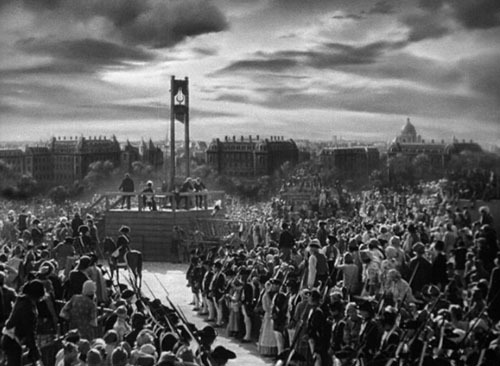 At the dramatic conclusion of this play, there is a surreptitious substitution at the guillotine. ﻿Six months later a special benefit performance of The Frozen Deep was mounted, in order to raise money for the family of the recently-deceased Douglas Jerrold. Jerrold – a playwright and journalist – had been a friend of Dickens for twenty years. The benefit took place on 4 July at the Gallery of Illustration in Regent Street. Queen Victoria was in attendance. Dickens had planned to raise an even £2,000 for the Jerrold family, but they fell short of the target. When he was invited by a promoter in Manchester to give several performances at the New Free Trade Hall, Dickens seized the chance to make up the shortfall. When Dickens went north to check out the facilities in Manchester, he realised that the hall was much too large for some of his amateur actors to cope with. They just didn’t have the training to project their voices into a hall designed to hold 2,000 people. Dickens decided to hire some professional actors who could handle these new demands. And that is how Charles Dickens met the actress Ellen Ternan. He invited the entire Ternan family to participate – Mrs. Ternan and her three acting daughters: Fanny, Maria and Ellen. They were all experienced actors and had been on the stage of many of London’s top theatres. Ellen Ternan was just eighteen when she performed in The Frozen Deep in Manchester. According to an intimate of the Ternan family, Ellen was “outwardly placid, but firm underneath”. Dickens’s second daughter, Kate, remembered her as “small, fair-haired, and rather pretty”. “She had brains,” Kate thought, but she was actually the least talented of the three acting sisters – pushed into acting because that was what the family did (she first stepped onto the stage when she was three years old), rather than responding to a sense of vocation. Dickens became enthralled by the teenaged actress. He was forty-five years old, married, with nine children. But he seemed drawn inexorably to this attractive young woman. It was a classic mid-life crisis. Like the male protagonist of his recent novel Little Dorrit – Arthur Clennam – Dickens’s attraction to this unattainable woman was probably intensified by his sense that life’s possibilities were slipping away from him, and by his unhappy marriage with Catherine. Meanwhile, the two performances in Manchester were such a triumph that Dickens agreed to add an extra show. And it was as he lay “dying” on the stage as the self-sacrificing Richard Wardour – near the play’s conclusion on this final night – that Dickens conceived the basic idea for A Tale of Two Cities. 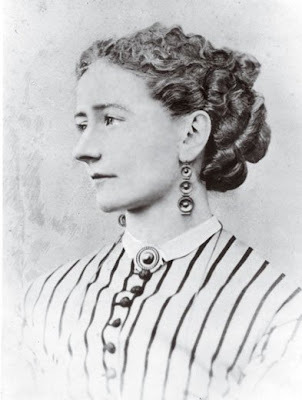 Dickens began a long, desperate pursuit of Ellen Ternan – but he had to do it discreetly, in order to protect both her reputation and his public image. He began to express what he was going through to some of his closest confidants. “Poor Catherine and I are not made for each other,” he wrote to John Forster. He turned away demonstrably from his wife in October, 1857. He instructed the maid to divide the main bedroom at Tavistock House into two rooms, by setting up a partition. He was so agitated at this time that one night he got up at 2 a.m. and walked 30 miles through the night from Tavistock House in central London to Gad’s Hill Place in Kent. At Christmas in 1857, there was no large family party because of the turmoil in the house. But Dickens did do some more public readings. He had given a powerful speech on behalf of the Hospital for Sick Children – it helped to raise £3,000. A few weeks later he did yet another public reading of A Christmas Carol for the same benefit fund, and finally the hospital was effectively endowed for the very first time. 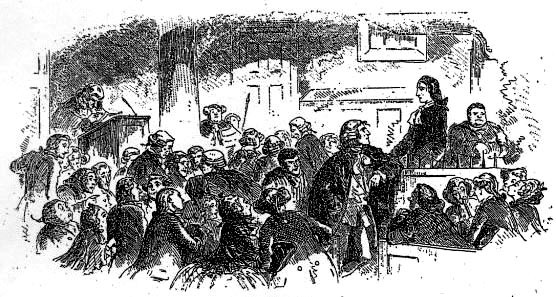 The power of these performances led Dickens to consider these public readings as an alternate source of income. He realised that if he undertook an extended tour around the country, he could raise some badly-needed funds to stabilise his own financial situation. There was, in fact, already a tradition of writers giving public presentations – more often lectures, though, than readings. They were undertaken both as educational activities and high forms of entertainment. He did a dry run in Edinburgh to see if the public would support his readings as paid entertainment, rather than charitable activities. It was a resounding success. His first non-benefit, paid public reading was at St. Mary’s Hall in London. 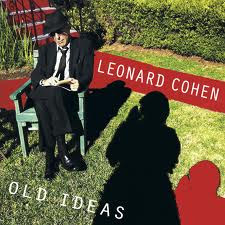 It was the beginning of a twelve-year run of public readings that would continue until the end of his life. In the early months of 1858 Dickens was still deeply estranged from his wife Catherine. In May he finally undertook to establish an informal separation between them. He wanted the whole thing to be discreet, of course, so that there would be no damage to his public reputation. To justify his actions, and to divert any possible suspicions about his growing relationship with Ellen Ternan, he began making some rather disgraceful comments about Catherine in letters to his friends. To Angela Burdett-Coutts, for example, he wrote of his wife: “She has never attached one of them [their children] to herself, never played with them in their infancy, never attracted their confidence as they grew older, never presented herself before them in the aspect of a mother.” This just wasn’t true, but Dickens really seemed to believe it. It was another example of how his imagination always seemed to trump reality. 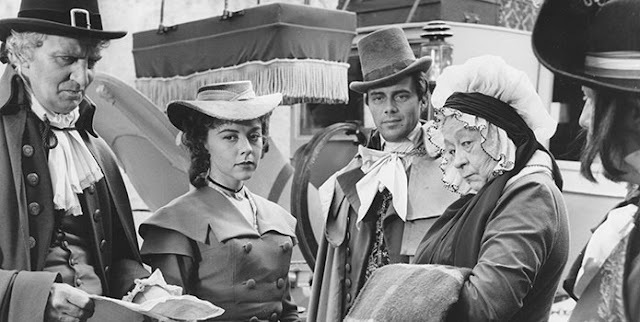 Dickens’s friends John Forster and Mark Lemon arranged the original separation with Catherine. Her mother, Mrs. Hogarth, attempted to draw up a deed of separation. And then things started to unravel. The Hogarths were threatening to sue Dickens in the Divorce Court – precisely what he was intent on avoiding. A legal settlement was quickly arranged: Catherine would get an annual income of £600; and she would have unlimited access to the couple’s children – as long as there were no lawsuits pursued by either of them against the other. Inevitably, when news of the legal separation emerged, rumours began to circulate about Dickens’s relationship with Ellen Ternan. Foolishly – instead of ignoring the gossip – Dickens got on his high-horse and published a statement in The Times denying that there was any improprieties in his friendship with Ternan. A classic example of “the man doth protest too much.” The public statement did not eliminate the gossip, of course – it encouraged it. The whole affair (pun intended) damaged his reputation and estranged him from many former friends and colleagues. To avoid facing this sort of public scrutiny, Dickens began going down to Gad’s Hill Place regularly in July. 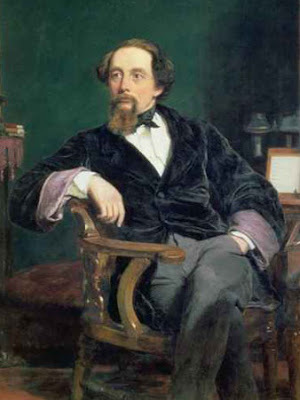 ﻿In the New Year of 1859, Charles Dickens sat for a portrait by William Powell Frith. It was commissioned by his closest friend, John Forster. The painting showed Dickens at home in his study. He is wearing a velvet jacket and posed on a chair, in front of his desk. Although the detail cannot be discerned in the painting, the paper propped up on the desk is the opening chapter from his new novel, A Tale of Two Cities. Forster loved the painting; Dickens, as usual, was not fully satisfied. He said his facial expression was that of a man who had just heard that a misfortune had befallen an unfriendly neighbour! To help capture the author’s features, Frith had made use of a photograph of Dickens taken by George Herbert Watkins, a well-known professional photographer, who had done a series of photographs the previous year in his studio on Regent Street. [One of those pictures is seen at the top of this review.] The painting and the photographs revealed a serious man, looking tired after the struggles of a difficult year. Home of All The Year Round on Wellington St.
﻿﻿One of the major casualties that occurred because of Dickens’s separation from his wife was his relationship with Frederick Evans – one-half of his publishing firm of Bradbury and Evans. Dickens was very upset at Evans’s critical attitude towards him. So he decided to cut his ties with them both. Negotiations began about the copyright to the novels (they had published the previous five) and the fate of the weekly magazine Household Words, which had had a run of nine years. Dickens bought out the rights to it for £3, 550. He determined to set up a new magazine as quickly as possible. It would be called All The Year Round, and would be set up in an office on Wellington Street. ﻿ Dickens realised that he needed to establish his brand new magazine immediately by jumping straight into a new novel. He still had the rough notes he had written following that episode on the stage in Manchester (when he had been “dying” as Richard Wardour). He soon had a title – A Tale of Two Cities. It was going to be published first as weekly instalments in All The Year Round; and then bound up monthly in the familiar green-covered wrappers. The new weekly was going to look identical to Household Words – with the same size, the same page-format (with two columns), the same drab look (no illustrations), and roughly the same number of articles. He planned for the magazine to include serialised novels, short stories, and topical articles. It would also cost twopence. But, finally, for the very first time, Dickens would have complete control of his periodical; he would be editor and publisher. And his very competent friend, William Henry Wills, would continue to serve as sub-editor. Dickens advertised his new weekly with newspaper ads, handbills, placards and billboards. Because of the tremendous success of A Tale of Two Cities, sales of All The Year Round would never drop below 100,000 copies – amazing, really, given that Household Words had been selling about 35,000 – 40,000 copies. 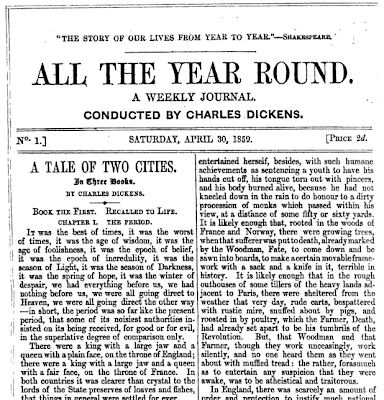 ﻿ The first issue of Dickens’s new weekly, All The Year Round, was released on 30 April, 1859. Dickens had had to work very quickly to get his novel on track for that date. As usual, he wanted to have a head-start on the story, in case any personal or professional problems interfered with his writing. So, when the first edition hit the shops in London, Dickens already had the first three episodes completed. 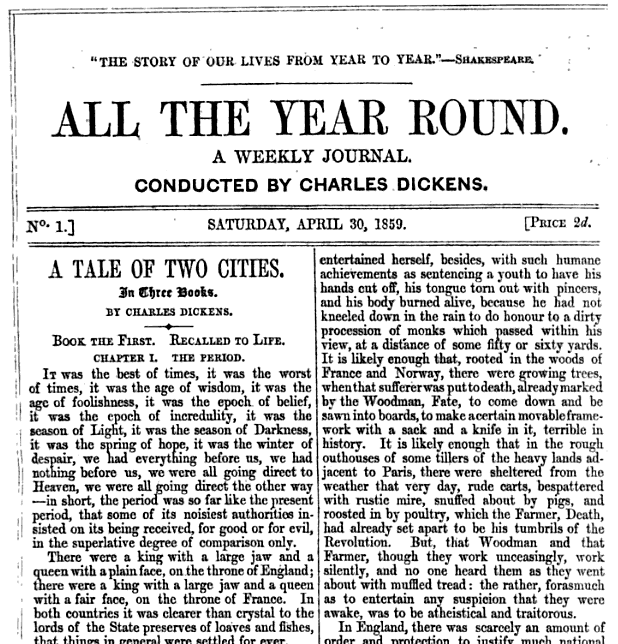 A Tale of Two Cities ran as thirty weekly parts from 30 April until 26 November, 1859. 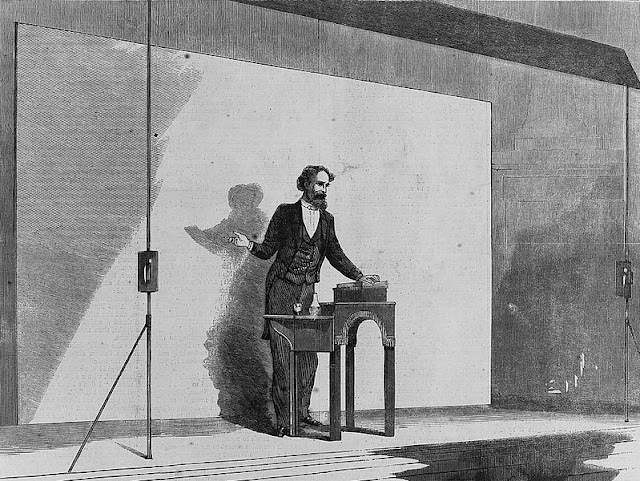 To print his magazine, Dickens went back to his former publishers Chapman and Hall. The illustrations were done by his familiar collaborator, Hablot Knight Browne (‘Phiz’). But Dickens’s relationship with the artist cooled, when Phiz agreed to work on Bradbury and Evans Once A Week – a new magazine set up as a rival to Dickens’s All The Year Round. A Tale of Two Cities would be the last book that Phiz would work on with Boz (Dickens). They had been working together now for 22 years – their first collaboration going all the way back to Dickens’s first novel, Pickwick Papers. Once Dickens got going on his novel, the writing came fairly easily. As mentioned earlier, Dickens had read Thomas Carlyle’s history of the French Revolution many, many times – in a letter once he claimed to have read it 500 times. Even so, he was keen to get other perspectives and further details of the period. 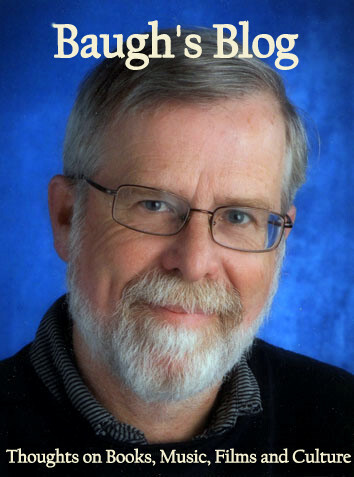 He contacted Carlyle and asked him to recommend some books on the topic. 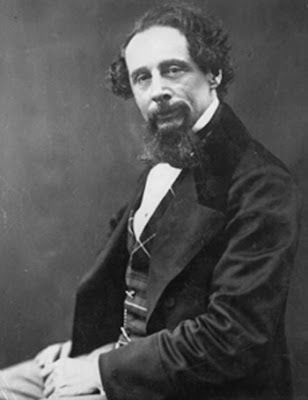 Dickens reported that his friend sent along a couple of “cartloads” of books from his own private library in his home on Cheyne Walk; and he read, or skimmed, most of them. Carlyle came to see Dickens do one of his public readings. He laughed vigorously throughout. When he went backstage after the performance to offer his compliments, he told Dickens, “Charley, you carry a whole company of actors under your hat.” When A Tale of Two Cities was first released in book form, Dickens dedicated it to Carlyle in gratitude for his “wonderful book”, his history of the Revolution. By the middle of May, Dickens was a complete “slave” to the new novel. He moved down to his house at Gad’s Hill Place in Kent for the entire summer of 1859, in order to work steadily on it. He set up a new routine. He wrote for his usual four or five hours per day from Wednesday to Monday; then he would travel to London on Monday afternoon, in order to work at the All The Year Round office all day Tuesday – returning to Kent on Tuesday evening. His focus on the novel was so intense that he finished it by early October, almost two months ahead of its final weekly instalment. Unlike most of his books, A Tale of Two Cities was built on story and incident, rather than character and dialogue – it was the momentum of its dramatic story that constantly propelled him forward. Dickens’s attitude to the French Revolution was typical of the English liberal of the day. He believed that the oppression of the aristocracy – the ancien régime – had established the conditions which pushed the peasants into revolt. Back in the mid 1840s, Dickens had written in The Examiner magazine that the revolution “was a struggle on the part of the people for social recognition and existence.” A philosophy of freedom and equality had overthrown a feudal despotism. During the immediate aftermath of the rebellion, Romantic writers in England had celebrated its early effects. Wordsworth, for example, had famously declared of those heady days: “Bliss was it in that dawn to be alive; but to be young was very heaven!” But then came Robespierre and the brutal excesses of the Terror. 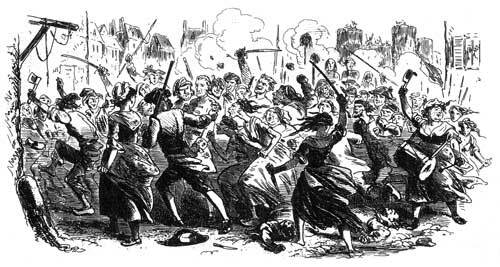 Dickens’s book would reflect this ambivalent response to the Revolution – condemnation of the old order, but horror at the virulence of the later violence. 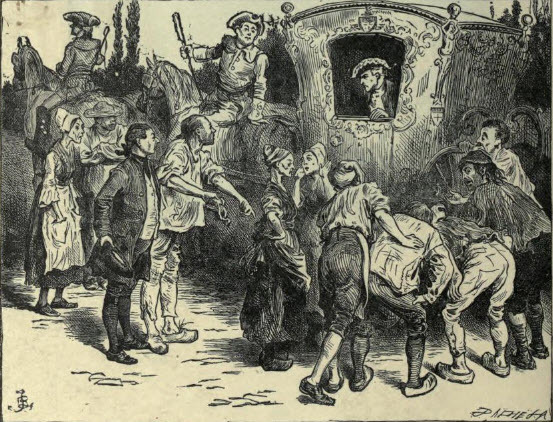 A Tale of Two Cities is a historical novel, only the second of Dickens’s career – the first had been Barnaby Rudge, a book focused on the anti-Catholic riots of 1780 in London. Barnaby Rudge had been a much more discursive book – typical of his early works, which were usually issued in monthly parts. The novels written in weekly parts were not as flabby – they usually contained a smaller cast of characters, and had a more direct story, with fewer sub-plots. A Tale of Two Cities fits that mold. It is straightforward, fast-paced, and tense – the excitement of the plot pushes the story forward. What Dickens does is quite brilliant – he compresses the entire, complex history of the Revolution into the story of a single family. Dickens selects several key moments in the Revolution, and shows how they affect the Manette family. Public history becomes private history. 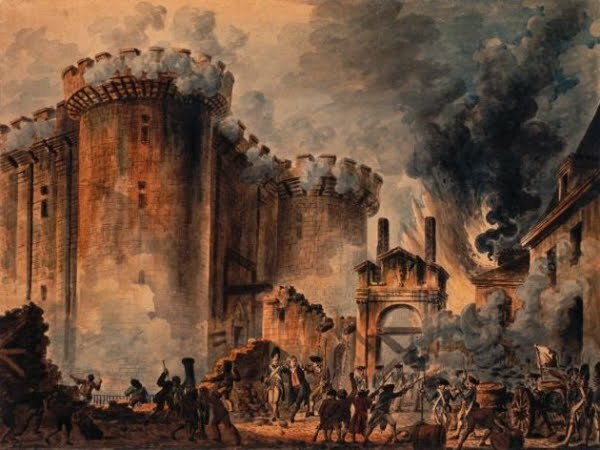 He creates vivid and dramatic scenes that embody different aspects of the conflict: the assassination of the cruel Marquis St. Evrémonde, for example, and the storming of the Bastille. As Simon Schama points out, Dickens also creates dramatic moments which not only illustrate a theme, but also suggest a ritualistic, or prophetic, quality. When a barrel of red wine smashes to the ground in the impoverished Parisian district of Saint Antoine, the residents clamber over to the puddles and riverlets, in order to slurp up the precious liquid. The scene emphasises the poverty of the city’s inhabitants, but the red stains all over the people’s hands, chins, and clothing, foreshadow the bloodshed that is to come. There are a lot of dialectics in this novel, a lot of twinning (“best of times, worst of times”): the trial at the Old Baily in London, in the early part of the novel, is balanced by the later trial in Paris, in front of the revolutionary tribunal; the sweet innocence of Lucie Manette is countered by the evil machinations of Madame Defarge; the active intentions of the self-sacrificing Sydney Carton balanced by the passive disinterest of Charles Darnay. There are the twin themes of life and death: characters recalled to life and earning their redemption, whilst others condemn themselves to death and destruction. There are also the twin themes of present and past – how memory links one to the other, and, can lead either to vengeance or reconciliation. And then there are the private demons underpinning Dickens’s passionate approach to the novel. The self-sacrifice of the cynical lawyer Sydney Carton echoes the self-sacrificing character of Richard Wardour in Collins’s play The Frozen Deep. Dickens is surely projecting his own feelings and yearnings into these two figures. And it’s not hard to see that Lucie Manette must have been inspired by Dickens’s infatuation with Ellen Ternan. As Dickens is writing this book, she is still the innocent and unattainable ideal of womanhood. And going back to the twining theme in the previous paragraph, Sydney Carton and Charles Darnay might be seen as a doppelgänger reflecting Dickens’s twin-nature at this time. As Charles Darnay (same initials as Dickens! ), he is the successful suitor of the innocent young woman, but disinterested and rather misunderstood; as Sydney Carton he is the troubled, unrequited, self-mocking ironist who sacrifices his life for the unattainable woman that he loves. A Tale of Two Cities, of all Dickens’s mature work, has always opened the widest gap in appreciation between critics and readers. The general public has always loved the book – it is one of the author’s most popular novels. Literary critics, until more recently, have rarely given the book its due. They tend to offer lukewarm equivocations: it is called “uneven”, “clumsy”, and “melodramatic”. It certainly doesn’t have the complex density of a book like Bleak House. But it does have several intertwining motifs that serve as potent symbols or metaphors – without slowing down the accelerating momentum of the plot. A Tale of Two Cities is undoubtedly the most dramatic of Dickens’s novels. So dramatic, in fact, that it was very soon adapted for the London stage, adapted by Tom Taylor for the Lyceum Theatre, although – truth be told – it was Dickens who pretty much directed the production. A Tale of Two Cities is not a difficult read. In some ways, it’s actually rather accessible: a comparatively short book (by Dickens’s standard! ), a story of romantic longing, with an uplifting and melodramatic ending. A real page-turner. If you wanted to introduce a young reader to the marvels of Dickens, this – or perhaps Oliver Twist – might be the place to start. But it is also a rather dark work – crammed with images of horror and destruction, and scenes of disease, dirt, poverty, imprisonment and execution. The mood overall is one of fatigue, decay and despondency – reflecting, perhaps, Dickens’s emotional turmoil. Here was a man, in some ways, in anticipation of death, but still clinging to the hope of a new love, a new redemption – a man desperate to be recalled to life. I am impressed by your photo review of 'A Tale of Two Cities' by the legend, Charles Dickens. I had been fortunate to write a new 'Work of Fiction' inspired by the Legendary Charles Dickens and his phenomenal 'A Tale of Two Cities', set against Modern times and Modern cities. I have titled my book as 'An Other Tale of Two Cities'. I have just completed writing the first cut of the book and is in the process of submitting it for review by a private group of friends and experts on Charles Dickens. I recently completed the first cut of the novel, 'An Other Tale of Two Cities', which is a tale that entwines the lives, loves and Times in the Two Cities, Chennai in India and Shanghai in China. 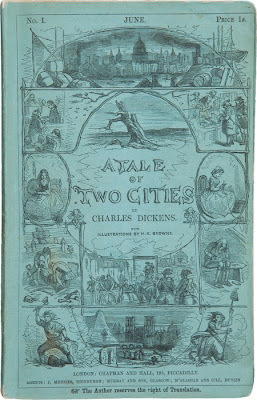 Having adopted the title 'An Other Tale of Two Cities', I feel I have taken up an onerous responsibility to do justice to the original 'Tale' by the Legend, Charles Dickens. Whether I have done justice as above is for the readers and experts to say. There are several similarities between the the original 'Tale' and 'An Other Tale'. They are both Triangular love stories for one. Both are stories about Love of the Heart and supreme Sacrifice. 'An Other Tale intertwines the lives and times of two modern cities; Chennai in India and Shanghai in China. Both tales are set in the times of political upheaval in the host nation and the characters are caught in the cross fire of warring fratricidal and internecine groups. Of course there are distinct differences. The times the stories have been set are different, the plots are different, the characters are different; the Characterization, their Experiences and the Classes they represent are different. The morals and integrity of the characters are different, while they reflect the times they live in. The story telling styles are different... to spot a few differences. I hope and believe that the characters and the story in 'An Other Tale of Two Cities' would endear the hearts of the readers as much as the original 'Tale' would. to seed some thoughts on 'An Other Tale of Two Cities' among a small number of public and private readers and experts, whose feedback, I would cherish, before the book is published. I am looking forward to your participation in the Review and for your valuable comments and feedback..